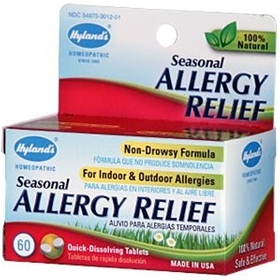 Hyland's Seasonal Allergy Relief relieves common allergy symptoms including watery eyes, runny nose, stuffy nose, sneezing, itchy eyes/nose/roof of mouth, pressure in the nose and cheeks, ear fullness and popping, dark circles under the eyes and hives. There are many studies proving the effectiveness of this non-invasive, safe approach to healing. Homeopathic Medicines are regulated as drugs by the FDA and their manufacturing facilities are inspected by the FDA.